Bryndi Thompson has always enjoyed working with people. She graduated from Kansas State University in 2013, obtaining her Bachelor’s degree in Family Studies and Human Services. 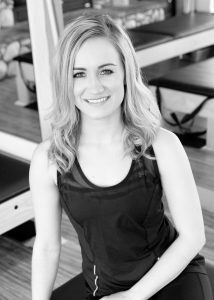 She is a working towards her certification as a Pilates instructor through the Pilates Sports Center. This certification takes a progressive approach to Pilates. It emphasizes original Pilates techniques, as well as current principles and anatomy education. Sports have always been a big part of Bryndi’s life, however, while growing up, she acquired numerous injuries while participating in them. When starting Pilates, she noticed dramatic benefits such as better spinal alignment, increased muscle strength and tone, enhanced self-esteem, as well as prevention and treatment of injuries. This experience has allowed her to properly care for herself and appreciate how Pilates can benefit people of all lifestyles. This Pilates journey has allowed her to integrate a healthy, non-competitive, and more gentle relationship with her body. Through this training she has learned creative and beneficial ways to help people seek unity and positive relationships with their bodies, while learning how capable the human body truly is.